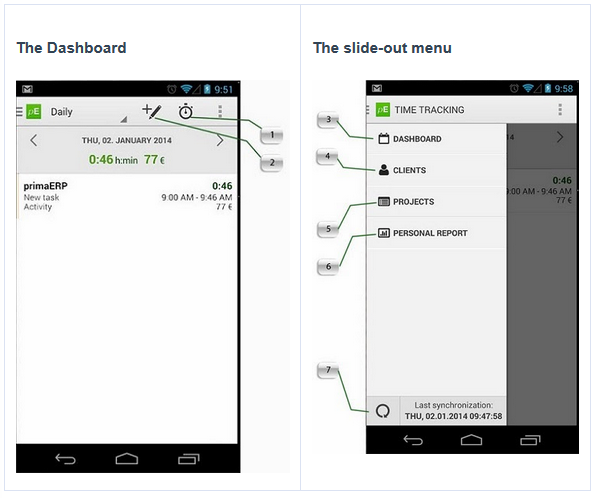 The mobile-app is a complementary tool of primaERP TIME TRACKING. It allows you to track your time and have a quick overview of your account from your Android smartphone or tablet while you're on the go. It allows you to work offline and later automatically synchronizes the data once you connect your device to the internet. Stopwatch button: To track the time while you are working. Track time button: To create a time record manually. Dashboard: Where you can see the list of your time records, either in a daily or weekly view. Clients: It contains the list of your clients so you can review it as well as add a new one. Projects: Place where you can check the status and information of your projects. Personal report: Provides a detailed report and a summary of your work. Synchronization tool: It provides the date and time of the last synchronization as well as allows you to do it manually.